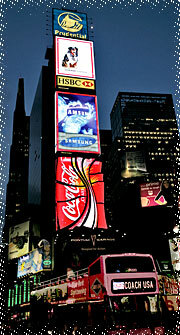 Here's an article from AdAge on advertising in Times Square. It's expensive - but it pays off. The cost-per-thousand-viewers impressions for the area range from $2 to $5, compared to around $20 for a prime-time network TV buy. That pretty much says it all. But of course, you've got to have the money to spend the money.